Typically when a record company releases a collection of stuff from an artist its either a single CD greatest hits album or sometimes a double album. Occasionally though you get something a bit more comprehensive. 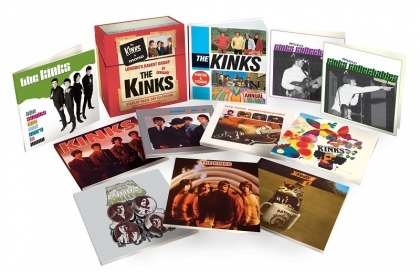 "The kinks in mono" is definitely in the latter category - this is one seriously impressive collection. Firstly it contains the bands first 7 albums - Kinks, Kinda Kinks, Kontroversy, Face To Face, Something Else, Village Green Preservation Society, and Arthur. 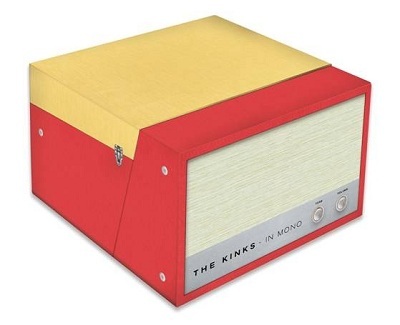 Then you have four EPs - ‘Kinksize Session’, ‘Kinksize Hits’, ‘Kweyt Kinks’, ‘Dedicated Kinks’ and finally another two discs (entitled The Kinks Mono Kollectables) of unissued tracks and various singles from around the world. All the discs are in Mono. That's ten CD's in total !! Sanctuary haven't skimped on the packaging either - the set also includes a 32 page, pop annual style book complete with new liner notes, memorabilia (including rare photos), discography information and more. Each CD arrives boxed in beautiful digi-pack packaging, all of which are all collectively presented in a rigid Dansette style box.